cumulative total of all relevant pits shall not exceed 0.040 in. Finishing marks If Ra max. is met. cumulatively, depth <0.003 in. and Ramax. is met. For vessels, if length < 0.50 in. at 0.003 depth and if <3 per inspection window. Surface inclusions If Ra max. is met. Surface residuals None accepted, visual inspection. 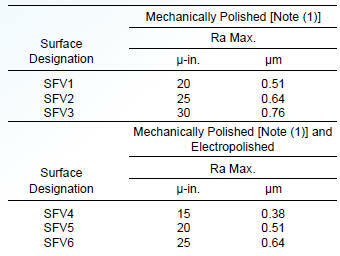 Surface roughness (Ra) See Table SF-3. Weld slag For tubing, up to 3 per 20 ft length or prorated, if<75% of the width of the weld bead. Porosity None open to the surface. Ra max. value in this table. not to exceed values in this table. numbers indicate a smoother finish. represents the average value of all peaks and valleys. Lower numbers indicate a smooth finish.